There are 138 Assisted Living Facilities in the Cockeysville area, with 4 in Cockeysville and 134 nearby. The average cost of assisted living in Cockeysville is $3,675 per month. This is higher than the national median of $3,346. To help you with your search, browse the 321 reviews below for assisted living facilities in Cockeysville. On average, consumers rate assisted living in Cockeysville 4.0 out of 5 stars. Better rated regions include Timonium with an average rating of 4.7 out of 5 stars. Caring.com has helped thousands of families find high-quality senior care. To speak with one of our Family Advisors about assisted living options and costs in Cockeysville, call (855) 863-8283. Cockeysville, Maryland, is a census-designated place located 17 miles north of Baltimore. Cockeysville offers seniors who enjoy the outdoors convenient access to recreational sites such as Loch Raven Reservoir, with miles of hiking and biking trails and lush greenery. Cockeysville's 15 percent senior population is served by 61 assisted living facilities (ALF) in the greater Cockeysville area, with four directly within the city limits and 57 nearby. 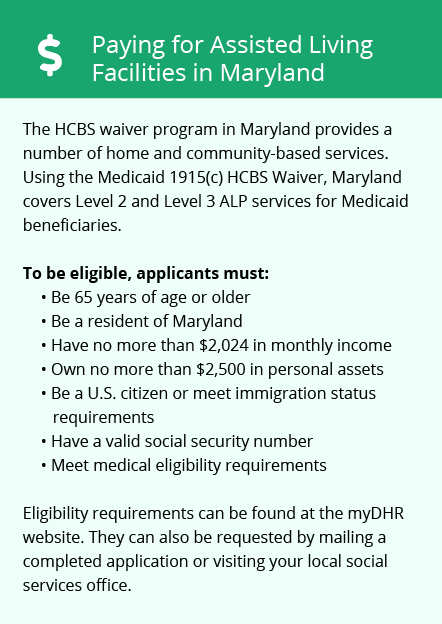 ALFs in Maryland are regulated and licensed by the Maryland Department of Health and are defined as programs that offer housing and supportive service to residents who need assistance in regular activities. The Cockeysville area has few facilities from which to choose in the event of a medical emergency or illness, with the nearest major hospital, University of Maryland St. Joseph Medical Center, located in Towson. Cockeysville has an array of community resources for seniors, including the Senior Center, an organization that offers fitness classes such as tai chi, recreational programs including miniature golf and nutritional information, as well as 19 other senior centers throughout Baltimore County. On a scale of A-F, Cockeysville's crime rates receive a D-, almost a failing grade. Because the crime rate in Cockeysville is four percent higher than the national average, seniors who choose to move to the area have a 1 in 34 chance of being a victim of either violent or property crime. The climate in Cockeysville includes hot, humid summers with frequent thunderstorms and mild to cool winters. Seniors who dislike the rain should consider looking elsewhere for assisted living, as each month averages four inches of rain. The Maryland Transit Administration's Light RailLink offers public transportation throughout Cockeysville and the surrounding areas. Seniors over the age of 65 qualify to receive reduced fares with a valid I.D. Air quality is ranked on a scale of 1-100 (with 100 being perfect air quality) based on the number of harmful air pollutants in the atmosphere determined by the EPA. The air quality in Cockeysville receives a 58, exactly equal to the average national air quality score. This suggests seniors' risk for respiratory illness and cancer is the same in Cockeysville as roughly anywhere else in the country. Assisted Living costs in Cockeysville start around $3,675 per month on average, while the nationwide average cost of assisted living is $4,000 per month, according to the latest figures from Genworth’s Cost of Care Survey. It’s important to note that assisted living rates in Cockeysville and the surrounding suburbs can vary widely based on factors such as location, the level of care needed, apartment size and the types of amenities offered at each community. 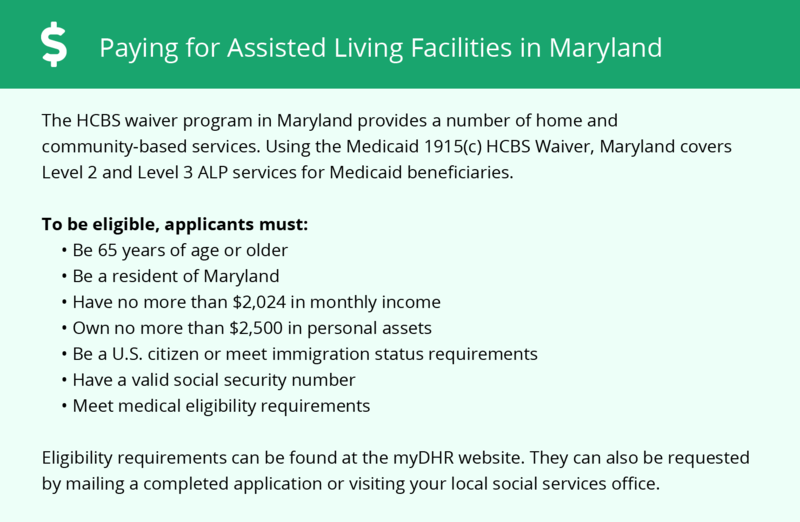 Throughout Cockeysville and the state of Maryland, the Senior Assisted Group Home Subsidy Program offers state funds to qualifying seniors who are unable to afford the cost of assisted living. Applicants must have a low or moderate income in order to be eligible. Learn more about these programs, plus who’s eligible, on our Assisted Living in Maryland page. For more information about different ways to finance assisted living, visit our Assisted Living in Maryland page. Cockeysville and the surrounding area are home to numerous government agencies and non-profit organizations offering help for seniors searching for or currently residing in an assisted living community. These organizations can also provide assistance in a number of other eldercare services such as geriatric care management, elder law advice, estate planning, finding home care and health and wellness programs. To see a list of free assisted living resources in Cockeysville, please visit our Assisted Living in Maryland page. Cockeysville-area assisted living communities must adhere to the comprehensive set of state laws and regulations that all assisted living communities in Maryland are required to follow. Visit our Assisted Living in Maryland page for more information about these laws.